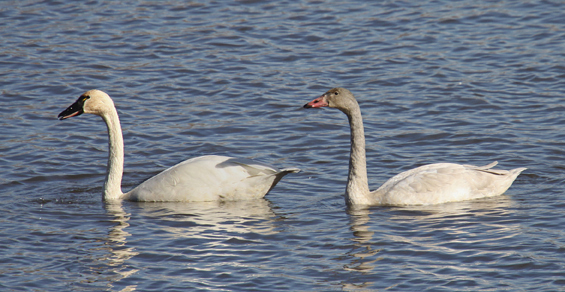 Where are the Tundra Swans at Rieck's Lake Park in Alma? Late this afternoon, we spotted a half-dozen up-river from the Observation Deck, resting (and for the most part, hidden) in the vegetation. They flew over the deck at 4:45pm. For a better look at this group of swans, head towards Nelson on State Rd 35 (Great River Road), turn right on County Road I, then right again on Badland Road which parallels the up-river side of the Buffalo River. Click here for a map. A dozen Tundra Swans have been hanging out in the pond at Tell (State Road 37 and County Road II) at Tell. Click here for a map. 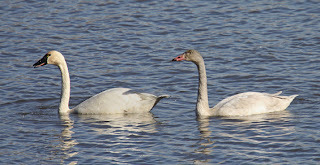 You can get good looks at Tundra Swans (~100) east of Rieck's Lake Park at County Road F and Cesler Valley Road, click here. Further up Great River Road (State Rd 35) towards Nelson, there are hundreds of swans off in the distance near the islands on the far side of the Mississippi River. Pull off the road on the river side of Cedar Ridge Resort and at the parking area at the Nelson Cemetery. Before you head out to look for swans, take a look at the Upper Mississippi River Wildlife and Fish Refuge website. Check out the fall flight surveys. Rieck's Lake is part of Pool 4. Click here for links to the pool maps. Tundra Swans were visible from Rieck's Park near Alma, WI, from mid-October until late November. There were also many sightings in the Buffalo River game area east of Reick's Park. Visitors enjoyed watching the Tundras from County Road I which crosses the Buffalo River just 3 miles from Alma. 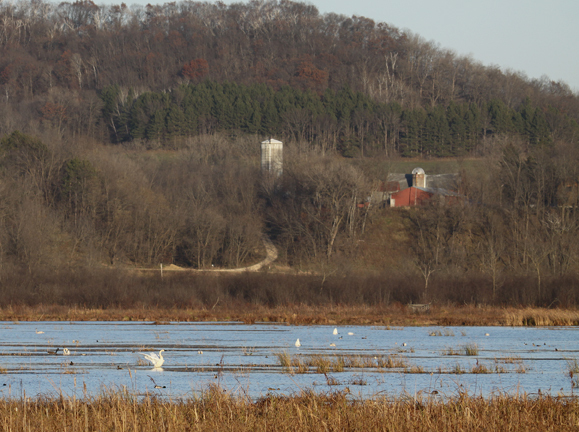 I want to report that at least three Trumpeter Swans stayed near Alma, WI, this winter. They can be seen through the telescopes at Wings Over Alma. Given the cold weather conditions, it is especially nice to view both the three Trumpeter Swans as well as 45-50 Eagles as they dive for fish at Lock & Dam #4, the only open water on the river for a number of miles. I could have stayed ALL day, and was so thankful for the help of the Wings Over Alma tourist guide who gave me some helpful information on things to see and do in the area this time of year. No doubt the Trumpeter Swans and all those Eagles were the highlight for me! I purchased some neat shirts and a book at the Wings Over Alma gift shop.